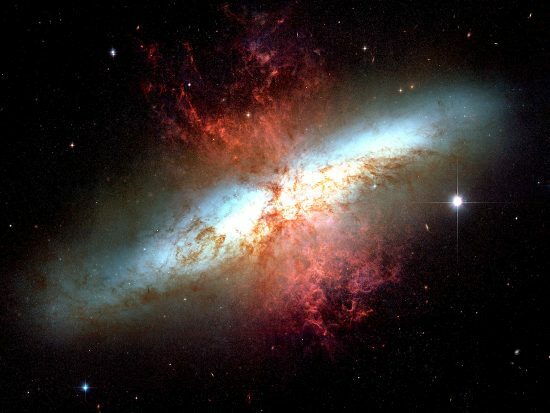 Galaxy M82 displays massive filamentation. Credit: NASA, ESA and the Hubble Heritage Team (STScI/AURA). Acknowledgment: J. Gallagher (University of Wisconsin), M. Mountain (STScI) and P. Puxley (NSF). Transverse electric currents accompany a main discharge channel. That channel is often seen by most people as a terrestrial lightning bolt. Slow-motion videos show that multiple leader strokes descend from the clouds, while less visible potential contacts rise from the ground. Once two points of contact are made, electrical energy stored in the cloud-to-ground capacitor discharges, drawing electric charge from several square kilometers. On Earth, a surface lightning stroke is accompanied by transverse, or “corona”, discharges at right angles to the main channel. They look like “tributaries” joining the primary discharge. Surface lightning constrains close tributaries to be parallel because of electromagnetic forces between them. Brachiated burns or cuts in various materials at different scales are sometimes called “Lichtenberg figures”. Lichtenberg figures are named after Georg Christoph Lichtenberg. They form when lightning bolts strike some material on Earth – it can be soil or even human tissue. They have also been artificially generated in blocks of acrylic plastic. Lichtenberg figures are also seen in the south polar region of Mars, and are referred to in previous Pictures of the Day as Martian “spiders”. So-called “streamers” were seen inside the shell of gas and dust that made up the haze around Comet Holmes 17P. They remained in the same alignment despite several months of travel: they did not rotate to stay aligned with the Sun. As previously mentioned, the braided filaments are a sign of helical Birkeland currents. 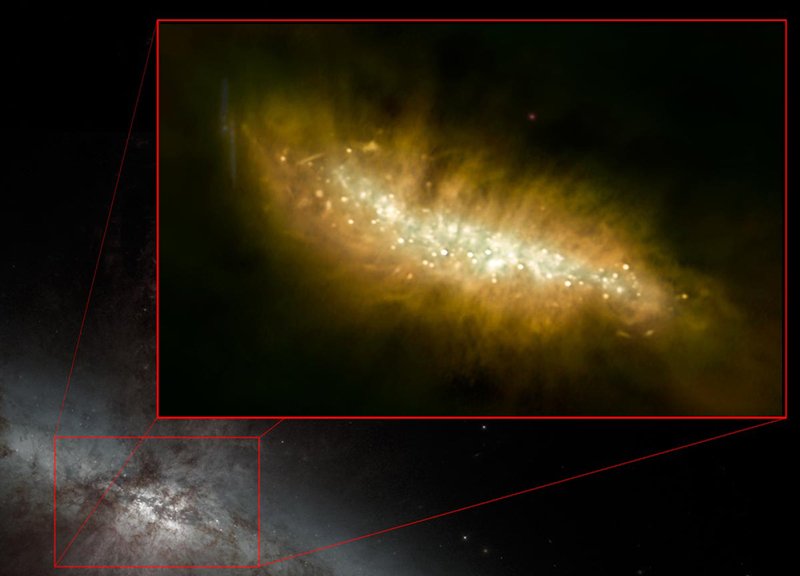 Scientists analyzing data from the Chandra X-Ray Telescope discovered “threadlike structures” emerging from M82, one of the larger galaxies in the constellation Virgo. The filaments extend for thousands of light years and contains groups of stars enclosed by glowing, ionized shells. Researchers refer to those rapidly moving star cluster knots as “fireballs”, because they look like flaming projectiles shooting out from the galaxy. Duration is also proportional to size. Sparks lasting two or three microseconds in the laboratory might scale up to decade-long events at stellar scales, or millions of years at the galactic scale. Filamentary shapes appear to exist no matter where investigators search. The forces exerted by electrified plasma contained in the twisting filaments of Birkeland currents dominate the Universe. They flow in a cosmic circuit that comes into our field of view and then back out into the void, with long-range attraction between them. In the image at the top of the page, M82 also displays streamers of material moving away from its equatorial plane at right angles. Corona arc discharges, an electrical phenomenon associated with terrestrial lightning, are occurring on a thousands of light-years scale.